An excellent update that builds on the success of its predecessor in all the right ways. The best Roland release in some time. Sample capabilities dramatically add to the flexibility. Far deeper sound shaping and effects than those of the original TR-8. Extra variation modes and automation add considerably to the sequencer. Added depth means that it loses a little immediacy. Effects are decent, but lack a bit of character. Auto-Fill mode gets old fairly quickly. Roland’s original TR-8 certainly wasn’t without flaws, but it managed to capture the fun, tactile experience of jamming out on a classic X0X groovebox. While Roland’s later Boutique TR-08 and TR-09 boxes look, function and - debatably - sound closer to their original inspiration, both are held back by their small and slightly fiddly interfaces. 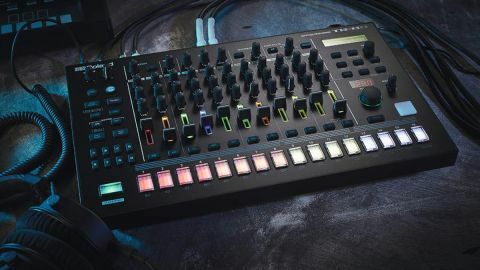 On the other hand, the TR-8, with its chunky sequencer buttons, sturdy rotaries and individual channel faders, felt ready to be bashed and cranked in a manner similar to the way artists like Jeff Mills or Egyptian Lover handle their original machines. It’s pleasing then, to see Roland return to the TR-8 format for a follow-up that builds upon the original and addresses most of its flaws and foibles. The most significant change here is the addition of sample playback. The original TR-8 was built entirely around Roland’s Analogue Circuit Behaviour (ACB) tech, which emulates the circuitry of the original hardware units on a component-by-component basis. That same technology is still at the heart of the TR-8S, providing models of the 808, 909, 707, 727 and 606. This time around though, these emulated instruments are joined by sample tracks. Any of the TR-8S’s 11 instrument tracks can be assigned to either an emulation or a sample, meaning that, alongside the expected pure emulation kits, the drum machine comes equipped with plenty of interesting hybrid kits, with lots of scope for mixing and matching the two sound sources. Those core ACB tracks once again offer high-quality, largely convincing recreations of the original boxes they’re based on. We’re not going to get too bogged down on the authenticity of these sounds here. Due to multiple design iterations, production quirks and decades of wear and tear of the original machines, trying to establish an ‘authentic’ sound can be a murky business. Plus, we’ve become so accustomed to hearing these sounds processed, sampled or emulated, that there can be a bit of a difference between what people expect from an X0X box and what the originals actually sound like. Interestingly, with the TR-8S, Roland seems to be acknowledging this somewhat by offering multiple variations on many of the sounds. For instance, we get a total of 11 ACB kicks, offering different takes on each instrument, including two ‘long’ variations of the 808 kick, as well as punchy ‘attack’ and bass-heavy ‘low’ variants of the 909. Suffice to say, the TR-8S certainly offers sounds that tick all the important boxes for what we expect from Roland drum machine emulations. As with the original TR-8, we’re sure opinion will remain divided, but for our money you’d be hard pressed to find better sounding emulations of these drum machines elsewhere. The ability to mix these up with sample tracks adds dramatically to the drum machine’s flexibility though. There are over 300 preset samples onboard and, although the TR-8S can’t act as a sampler itself, users can import their own sounds via an SD card (both mono and stereo, in WAV or AIFF format). Even without adding any additional samples though, the TR-8S is generously packed with an impressive range of sounds. Roland’s Aira branded gear has sometimes tended to skew a little too hard toward the EDM/big room end of the spectrum when it comes to preset sounds. Those bases are still covered, but they’re joined by a broad range of tones covering analogue beats, vinyl stabs, retro FX, melodic one-shots and much more. It’s not just the range of sounds that have been upgraded from the original TR-8, but also the depth of shaping. As with the original, each track has its own level fader, along with front panel controls for the tuning and decay of the sound. Here those are also joined by an assignable CTRL rotary, which can be set to control one of a list of parameters for each track accessed via the top right menu screen. Thanks to this screen and its associated controls, it’s possible to go much deeper into the setting of each sound than on previous versions. As well as the front panel parameters each track also has editable gain, pan, reverb and delay send levels as well as an assignable LFO per-track. Some sounds have their own unique parameters too: kicks have an adjustable attack setting, snares have a ‘snappy’ parameter, and toms have an adjustable ‘colour’ setting, controlling the length and ambience of the sound. One of the most significant upgrades for the TR-8S is the addition of six assignable outputs alongside the main stereo outs. This total of eight jack outs still doesn’t quite equate to one-out-per-track, but it does feel like a big step up from the original’s four outs. What’s more, the process of assigning outputs is much easier here; with the original TR-8, directing an instrument to an auxiliary output involved switching the machine off and on again to access a boot menu, here assignment can be made from the screen, meaning you can adjust output assignments without breaking the flow of a session or performance. Each of these outs can also act as trigger out, for routing to external analogue gear and other hardware. There’s also an additional mini-jack trigger out too, in the style of those on Roland’s recent Boutique machines. As before, there’s also a stereo pair of audio ins. These can be used as an external audio sidechain, or to process audio with the auxiliary or master effects. The TR-8S also has a USB connection. As with the original, this allows for MIDI over USB, as well as allowing the unit to act as an audio interface with individual outputs for each. Sample tracks have a number of additional menu parameters too, allowing users to adjust the base tuning, rate and envelope shape of the playback. Samples can also be shaped with their own high/low-pass filter, which has its own AD envelope, along with a bit reduction effect, and spread setting that offsets the left and right channels to create a stereo widening effect. Beyond these parameters, each track now has an insert effect slot. This can be filled from a list of 12 effect types, covering multiple types of filter and EQ, a transient shaper, compression, drive and bitcrushing. Each effect has multiple parameters to shape and tailor the sound, with primary ‘performance’ parameters - filter cutoff, drive level, etc - that can be assigned to the front panel CTRL knob, automated or modulated by the track’s LFO. In addition to these individual track effects, the TR-8S also features delay and reverb auxiliaries and one master effect slot. Both the auxiliaries feature multiple effect types, and the master effect slot features 19 options, again featuring a host of filter and EQ types, multiple flavours of distortion, compression, two transient shapers, as well as a phaser and flanger. On the whole the quality of these is solid, if not always inspiring - the EQs, filters and compression are great shaping tools but don’t impart much in the way of character, and the distortion and drive lacks a little warmth for our taste. We’re not one of those who gets hung up on Roland’s refusal to release an analogue X0X reissue, but this is the one area we do feel the TR-8S shows its digital roots - the addition of a master analogue distortion or drivable filter would really set some of these sounds off. Beyond the sounds, the sequencer sees a number of improvements too. The main is the addition of eight variation modes for each pattern. The original TR-8 had two chain-able pattern variations, labelled A and B. Here that’s bumped up to A to H, which can be chained, or triggered in any assortment of combinations to mix up and rearrange longer patterns. The other major sequencing enhancement comes from the addition of parameter automation. This allows front panel parameter changes to be saved as part of a sequence. These can either be record live or input on a step-by-step basis. These features really enhance the TR-8S’s potential as the hub of a live setup; making it possible to program and play back long beat tracks. The new Fill functionality is great too; this allows two of the A to H variations to be assigned as Fills, which can be punched in manually or automatically to add breaks or interest to your patterns. The TR-8S also gains an Auto-Fill mode. This is essentially an evolution of the original’s Scatter effect, which can insert automated randomisation. This works fine, although personally we’d get tired of the effect pretty quickly - it’s no match for programming your own fills and turnarounds. Finally, it’s worth saying that the TR-8S also addresses one of our other (slightly fickle) bugbears about the original TR-8: its garish green trim. The new sleeker, matt black chassis is much easier on the eye. The one thing we’d say though, is that its new flat profile - as opposed to the slightly angled top panel of the original - is less convenient when using the drum machine at desk level in the studio. On the whole though, the TR-8S is excellent. It builds on the potential of the original in all the right ways. The added depth does lose a little of the immediacy - we miss the front panel controls for snare snap and kick attack - but the trade off is balanced well overall, creating a machine that’s far more flexible but still intuitive and, most importantly, a lot of fun to use. It’s nice to see Roland releasing a ‘heritage’ product that’s also packed with new ideas and doesn’t get bogged down in revisiting the past.